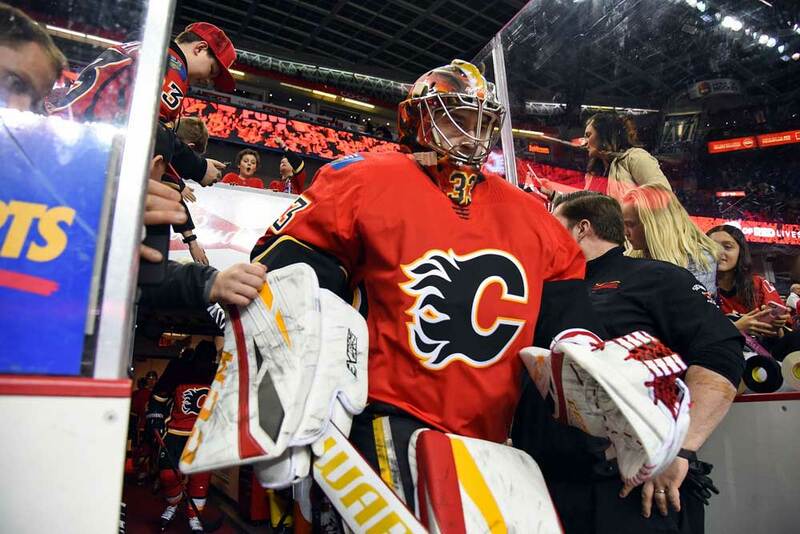 Will the Calgary Flames Burn Out Before The Playoffs? With an 18-point cushion over the last wild card team in the Western Conference, the Calgary Flames soon need to decide if they’re going to take the foot off the gas during the stretch run or go all out for a divisional and conference crown. They also need to decide whether to stand pat or make a splash before the trade deadline and if they need a goaltending upgrade. Some fans believe they should just cruise into the playoffs at this point since they should be one of the first Western clubs to lock up a berth. On the other side of the coin, there are those who feel they should aim for the stars to secure home-ice advantage for as long as possible during the playoffs. Since the All-Star break it appears the team is taking it easy considering they’ve lost two of three games including a 5-2 home decision to the San Jose Sharks. The Feb. 7th loss meant the Sharks climbed to within two points of the Flames at the top of the Pacific Division. In addition, Calgary’s netminding and defense is showing a few cracks by conceding 34 goals in their past 11 outings. Like every NHL side, there’s room for improvement in Calgary. Even though they’re one of the top teams in the league they could still use some scoring depth and muscle up front. They could also solidify the blue line corps and perhaps add some experience in net. At this point in time though it looks like Calgary general manager Brad Treliving doesn’t have too much to offer teams in return to address all of his needs. The Flames don’t have a second-round draft pick in 2019 to trade and most of their top prospects are already with the squad and are deemed too valuable to ship out. Calgary appears to be a legitimate contender for the Stanley Cup and there aren’t many experts who saw that coming when the season faced off in October, especially considering the way they played last season. However, the team’s been pretty consistent this season with a few minor hiccups along the way. They’ve come from behind on several occasions to win games, kept racking up points, and suddenly found themselves as the team to catch in the West. Not everything has been rosy though as head coach Bill Peters has had to juggle his goaltenders along the way. On paper it would appear 26-year-old David Rittich is firmly entrenched as the number one despite starting the season as the backup. He’s 20-4-4 with a 2.54 goals-against average and 91.3 save percentage and has tarted nine of 14 contests since Jan. 1St.. He was pulled early against the Sharks however after a bad giveaway led to a goal. Thirty-six-year-old veteran Mike Smith won the starter’s job coming out of training camp and is 14-11-1 with a 3.11 GAA and 88.9 save percentage. But even though Smith was named the team’s starter, Peters planned to give Rittich a decent workload to make sure Smith wasn’t worn out by the end of the season. Now the goalies’ jobs have been reversed due to their performances in the crease. Both netminders will need to be in top form and remain healthy in the immediate future since February is such a busy month and so much is at stake if they hope to take a shot at the divisional title. Due to a grueling schedule and travel requirements as well as constant time-zone changes, the Flames need two in-form goalies down the stretch. If Peters starts Rittich for the majority of games the rest of the way he’s risking injury and burnout to his best netminder before the playoffs. But he also needs to pickup more wins and points. The Flames have the option of trading for goaltending depth considering Smith will turn 37 years old on March 22nd and his play has been on the decline. Potential goalies available between now and the Feb. 25th trade deadline could be Ryan Miller of the Anaheim Ducks, Jimmy Howard of the Detroit Red Wings, Anders Nilsson of the Ottawa Senators, Darcy Kuemper of the Arizona Coyotes, Keith Kinkaid of the New Jersey Devils and possibly Sergei Bobrovsky of the Columbus Blue Jackets. However, Bobrovsky and Howard would cost too much in return and are number-ones, so Calgary would likely be looking at an affordable option to cover themselves for the remainder of 2018/19 only. As for adding depth up front, specifically on the flanks, the Flames may have some interest in the New York Rangers’ Mats Zuccarello, Micheal Ferland of the Carolina Hurricanes, Ryan Dzingel of Ottawa, Gustav Nyquist of Detroit and Marcus Johansson of New Jersey. But with the Calgary possessing four forwards and one defenseman with at least 50 points this season, there’s a good chance Treliving doesn’t disrupt team chemistry by making a trade. All five of their 50-point scorers are averaging over a point-per-game with Johnny Gaudreau leading the way at 1.37 followed by Sean Monahan at 1.15, Elias Lindholm with 1.11, Matthew Tkachuk at 1.06 and blue liner and team captain Mark Giordano at 1.04. Even though Calgary boasts the second-most goals in the league at 199, it’s not all high-octane offense though as some players such as Tkachuk, Monahan, Michael Frolik and defender Noah Hanifin are enduring mini slumps at the moment and winger James Neal has just five goals and 14 points in 52 games this year. The team’s natural competitiveness will see it try to top the Pacific Division and Western Conference between now and the end of the season. But Calgary needs to remember the ultimate goal is to win the Stanley Cup. They can’t afford to burn themselves out down the stretch by aiming for top spot without saving something in reserve for the playoffs.